From modern plastic moulded systems to cast iron, pressed and formed steel gutters as well as smaller conservatory and greenhouse ducting can be cleared. 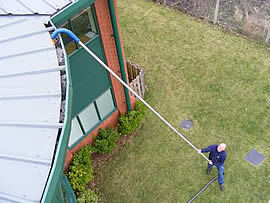 The system uses a high tech wet and dry vacuuming process operated from the ground. There are no extended set up times for access and no height working health and safety issues. Using CCTV cameras we constantly monitor what we are doing. 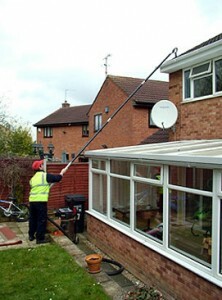 A key benefit of our ground based system, over and above safety, is that we can clean gutters in difficult access areas where ladders cannot reach (our equipment extends comfortably to three storeys). The only alternative would be to use expensive hydraulic platforms or expensive and time-consuming scaffolding. 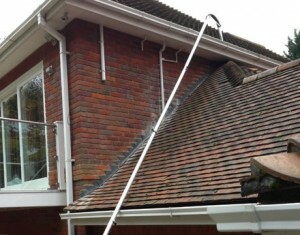 The self contained, ground based nature of our gutter cleaning service makes it a very cost effective solution to maintaining your guttering. Our special YOUR STREET DEALS: are available from time to time. Adjacent operations on the same day allow us to operate more efficiently and we are very happy to share any discounts among neighbouring properties. The more there are, the bigger the individual saving . . . . . Please ask for details. Call us for joint neighbour discounts. Call us and we will speak to your landlord. Feel free to call for a no obligation chat.